You are at:Home»Amusing Planet»The Most Spectacular Marble Caves in the World! The Most Spectacular Marble Caves in the World! There are so many places to see around the world. Some of these spectacular attractions are man-made while others are natural. While planning their holidays, people keep on searching for places that are less explored and have not lost their unique and natural charm. 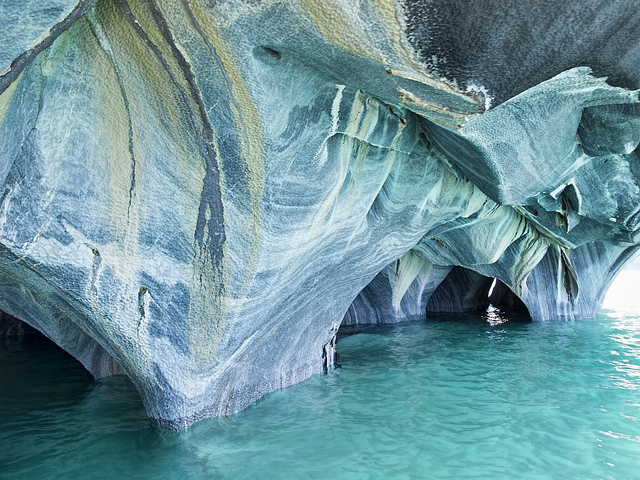 If you wish to visit a place that would literally take your breath away then marble caves in Chile are sure to leave you spellbound. The beauty and serenity of this place lies in the fact that it is far away from civilization. 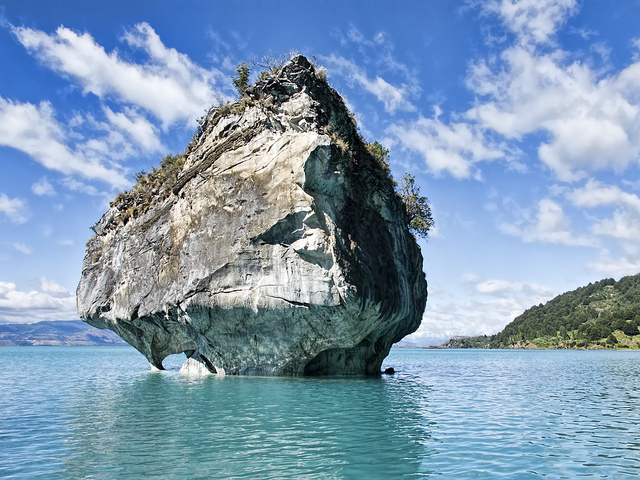 Formed at the General Carrera Lake in Chile’s Patagonia, it is amongst the best attractions of South America. The Lake in itself is an isolated glacial lake covering the border of Chile-Argentina, which makes it the largest lake in Chile and fourth largest in Argentina. Often listed in the places to see before you die, it is a natural formation of caves made out of marble due to water clashing with the calcium carbonate walls from the past 6000 years, thus forming stunningly beautiful caverns. There are crystal clear, smooth edged walls reflecting innumerable colors that make up these caves. Each time you visit, there is a whole new experience waiting for you to explore. With the difference in light and level of water throughout the year you can witness various forms of these caves. From deep blue to turquoise to the lightest of blue, everyone is spellbound with this natural sanctuary. The scientists say that it is the finely ground glacial silt, which gives the water its unique color and clarity. Photographers from all over the world come here to capture the various moods of this cavern, with only tiny boats to carry tourists from the shore into the caves it is worth the experience. The boats are the only means of travel there due to inaccessibility from roads, etc. so there are a lot of local operators giving a half an hour tour of the place. Some people have gotten so mesmerized by this outstandingly astonishing place that they have built holiday homes near it, just to experience living in heaven while still on Earth. There are no direct flights to take you to the marble caves, but there are certain tour operators who arrange packages with cars to help you visit them from the nearest possible airport, train station or bus stand. So next time when you plan your holiday don’t forget to tick marble cave off you wish list, it is worth every penny or maybe more. I’m glad you liked the post 🙂 Torres Del Paine is an amazing place as well. It’s a natural wonder, it has everything, stunning views of lakes, mountains, waterfalls and variety of flora. The scenery makes it one of the very special places. Just be prepared for the weather! I was there about a year ago, this was one of the most amazing trekking I did in my life life.